From 1952 until 1962, the waters of Moreton Bay were home to the Tangalooma Whaling Station. Over the course of a decade, for five months of the year, around 150 men were employed from all over the world to harvest whales barbarically for their meat and bones. In the off season, they would often drink beer and produce intricate engravings on the teeth of harvested whales, better know as "Scrimshaws". While the whaling station is no longer operational, there is one thing that remains prominent in Moreton Bay, a green nautical marker from which this Brisbane micro takes its name, Green Beacon. The beer in tribute to it is brewed with all Australian pale barley and Wheat for a light malt character and is designed as a showcase for Australian grown hops. 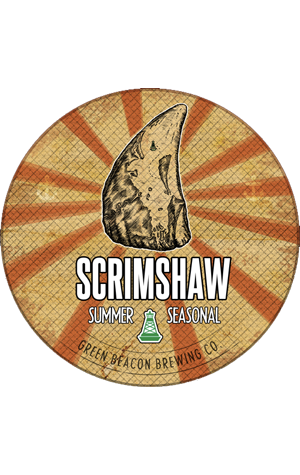 The brewers say it's "Bursting with hop aromas of tropical fruit and subtle herbaceous notes of mint and fresh cut grass. The aroma is backed up with flavours of fresh citrus, pineapple and passionfruit. This combination of Australian hops offers a perceived bitterness and resinous mouth coating finish, without being astringent."